-Portable dead-bolt, requiring no tools and installing in seconds to any exterior or interior standard door and withstanding up to 1,700 pounds of pressure—(even those of you with marginal SAT math scores can see that "up to 1,700 pounds" could also mean three pounds): check. About the cigars — I don't smoke them, but I'm not sure about the monks. 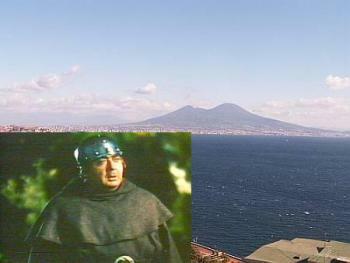 My view of monks was forged in the crucible of Eugene Pallette's great portrayal of Friar Tuck (photo insert, above) in the 1938 Warner Bros. epic, The Adventures of Robin Hood. He was a pretty swashbuckling guy; he drank wine, ate mutton (whatever that is) and cudgeled lots of heads according to the medieval monastic dictum that it is better to cudgel first and ask questions later. (WHAM! "Are you saved, my son?") Thus, if they had had cigars in Friar Tuck's day, he would have smoked them. As a matter of fact, different monastic orders say truly catty things about one another. For example, Benedictines may tell you that Franciscans drink too much; Franciscans may tell you that Dominican choirs don't sound much better than Little Richard (or, Parvus Ricardus, as they put it); the Carthusians, of course, invented the color chartreuse, "But what have they done for us lately?” ask most other monastic orders. Trappists, of course, don't talk about other monks because Trappists have taken a vow of silence, which they break only once a year to complain about the incessant racket of sandals shuffling in the abbey corridor. And no one has anything good to say about a cappuccino whipped up by a Capuchin friar (though the Capuchin monkey, cebus capucinus, native to Central and South America, is said to brew a pretty tasty cup of Java, which is nowhere even near Central or South America). You may wonder why I spend so much time rambling on about monks and then wind up with a nun coming to the door. Well, it's was a dream —or at least a fantasy— so maybe that might get me off the hook; however, there is a real reason for which I am quite willing to step up and take no responsibility, whatsoever. I was up at the Camaldoli monastery many years ago when it was precisely a monastery; that is, there were monks. Men. You couldn't get into the inside grounds, but you could wander around in the Outer Sanctum, a couple of shops, as I recall. The brothers cauldroned up various herbal remedies and ointments, including some fermented ones that were guaranteed to cure even Protestantism. BUT I missed the switch-over to nuns in 1998, the year in which the Bridgettine order of nuns took over the place and started to run it, essentially, as a large Bed and Breakfast. I had remained ignorant of the nunnification of Camaldoli. My ignorance was not enlightened by the linguistic curiosity Italian commonly uses "monastery" and "convent" interchangeably. Thus, people still called it the "monastery of Camaldoli" and, silly me, I thought they still meant monks when it fact they were talking about nuns. So I fantasized about monks and not nuns. As you may read here, the convent is run by the Order of Santa Brigida. I'm not sure if my nun fantasies are worth much. When I first saw their headgear, it reminded me of the old protective headgear that bicyclists used to wear. I imagined that they looked like motorcycle helmets and wondered if the nuns, in fact, were a coven of bikers who rode out at night and terrorized the locals while we were asleep.That appealed to me..."She wore a black denim habit with motorcycle boots and a black leather jacket with an eagle on the back!" Vroooooooooom! Actually, the real story behind the headgear is much more interesting. The helmet or "crown" is a white band at the forehead crossed by two over-the-top strips, one front to back, the other side to side, pinned at 12, 3, 6 and 9 o'clock by metal studs plus a fifth stud on top to join the crossed strips. It is supposed to represent Christ's crown of thorns at the Crucifixion, and the studs to mean the five Wounds of Christ. At first, I could only count 4—3 nails and a lance. What was the other one? [I did a little research and this is a quiz show question if ever there was one. In Western Christianity, the phrase is usually "The Holy Wounds of Christ" and there are, indeed, four since most depictions of the Crucifixion in the tradition of Western Christian art show Christ's feet overlaid such that they are pierced by a single nail. Eastern Christianity, however, shows Christ's feet side by side, each pierced by a separate nail; thus, The Five Wounds of Christ. It is interesting that an order of Western nuns would use that term.